Brand new, funny and friendly place consists of cosy bedroom with a double bed, airy living room with well equipped kitchenette and the bathroom (shower cabine, toilet, basin, hairdryer, iron and ironing board). Perfect for couple as well as family with children or small group of friends (sofa in the living room in convertible). The apartment itself is brand new and the whole building was thoroughly restored this year. It is located on a quiet top floor with lift/elevator. 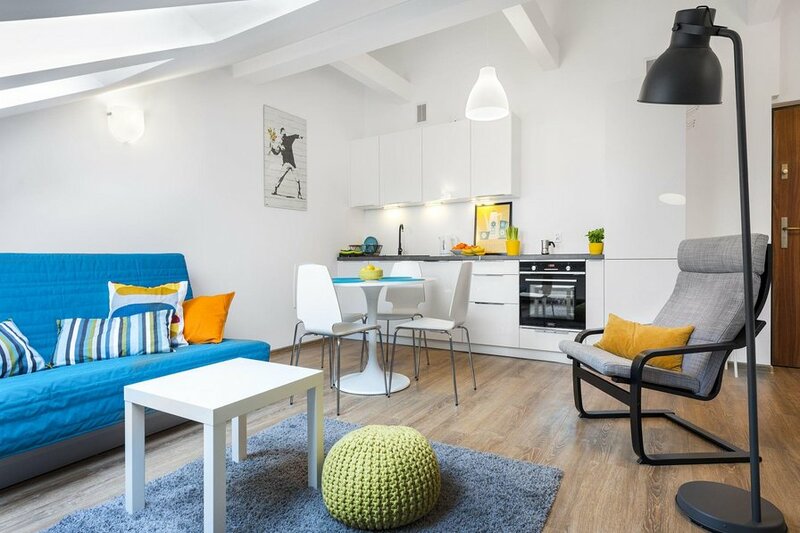 The Salvator Apartment is a perfect place from which to explore Krakow. Conveniently situated in the foothills of the Royal Castle - Wawel and just 10 minutes walk to the medieval Main Square, with all its attractions. The riverside is really nice for a walk or do some jogging. You can walk along the river towards the Jewish Quarter Kazimierz, the lively former Jewish district of Krakow. A small town in a big city, Kazimierz owes its unique atmosphere to the historical neighbourhood and has many interesting attractions: galleries, antique shops, restaurants, original bars and pubs.